My parents just celebrated their 30th wedding anniversary. I can’t quite fathom 30 years yet, considering I wasn’t even a thought 30 years ago. My younger sister and I decided to surprise our parents with dinner, champagne and cake. This translated to me cooking and my sister setting the table. On the menu was French bistro skirt steak with shallots and red wine reduction sauce, champagne risotto, and sauteed asparagus. I had never cooked skirt steak until I took a French cooking class about a year ago. Cut from the beef flank, the skirt steak is the diaphragm muscle (which lies between the abdomen and chest cavity), and is one of the tastiest and most affordable cuts of steak (about $9.99/lb.). It’s a long, flat piece of meat that’s flavorful but rather tough. Properly cooked, skirt steak can be quite tender and delicious, but is also one of the easiest cuts of meat to overcook quickly and ruin. For all my fellow meat eaters who squirm at the sight of fat (agh! ), don’t worry! While this cut is well marbleized, it literally melts off when cooked (trust me, I was the kid who dissected their meat before eating it). Recently, skirt steak has also become quite fashionable because of the Southwestern dish, fajitas. There are two ways to cook the skirt steak: to marinate it for a long time to tenderize it, then cook it for a longer time over lower heat, or to crank up the heat and sear it for just a few minutes on each side. It can either be quickly grilled, or stuffed, rolled and braised. In bistro-style cooking, it is pan-fried on the stove and then served with sauteed shallots. 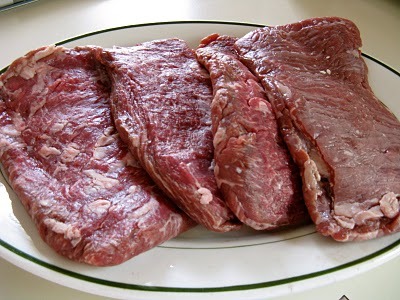 A lot of grocers will pound the skirt steak before you buy it making it a very, very thin cut. For his recipe, the skirt steak should be about 1 1/2- to 3-inches thick or more. You can explain to the butcher at the grocery store what you are making and they should be able to pull a few pieces from the back that haven’t been pounded. I’ve had best luck finding skirt steak at Whole Foods in the DC area. Pat dry skirt steaks with paper towels or dish cloth. Season generously on both sides with sea salt and black pepper. Refrigerate for at least one hour before cooking. Note: Sea salt has a cleaner, saltier flavor compared to table salt. 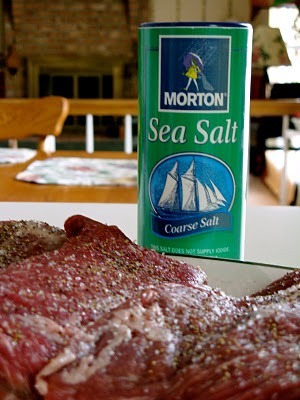 It will keep you from over-salting food after cooking and is the preferred method of seasoning when grilling meats. Simmer shallots, red wine and red wine vinegar on medium heat into a syrup. 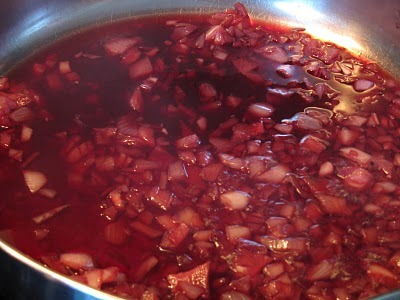 The shallots will begin to absorb the red wine and turn red in color, approximately 20 minutes. Add 1/2 cup chicken stock and reduce by simmering half way. Reserve until ready. Heat EVOO in a stainless steel pan on medium to medium-high heat. Do not use non-stick. You will be pan searing the skirt steak and will want it to brown. Skirt steak about 2-inches thick should be seared 6-7 minutes on each side to be cooked until temperature is medium-rare. Skirt steak should not be cooked above medium temperature. After skirt steak is removed from pan, reduce heat to medium-low and add remaining 1/2 cup of chicken stock to the pan you seared the skirt steak. Deglaze the pan, and pour brown bits and chicken stock into red wine reduction sauce. Reheat and swirl cubed butter into red wine reduction sauce. Slice skirt steak, pour red wine reduction sauce over top and garnish with parsley. Come back tomorrow for part two… champagne risotto!